My parents were in town recently and I decided that a simple dinner was in order. Definitely a "no hassle" dinner that night and to me it would have to be a simple roast chicken. Everything gets dumped into the oven and I don't have to watch it at all. I have done quite a few roast chicken variations before and decided to try something different this time round. I used rosemary as the main herb which I think is pretty unusual. I have always associated rosemary with a lamb dish. Surprisingly it does taste good with chicken and throughout the roasting process the smell of the herb filled my entire kitchen. The lemon zest added that extra citrus flavour to the meat. I made squashed roast potatoes (I thought the word "squash" was kinda cute) to accompany the roast chicken. I must say that the potatoes were really, really good! As they had been roasted whole, the skin was crunchy when eaten warm. I would call the entire meal a delicious one and great for entertaining if you have guests. 2) Rinse the chicken, then dry it very well with paper towels, inside and out. This will help get a crispy skin. Season the cavity with the coarser salt mixture. 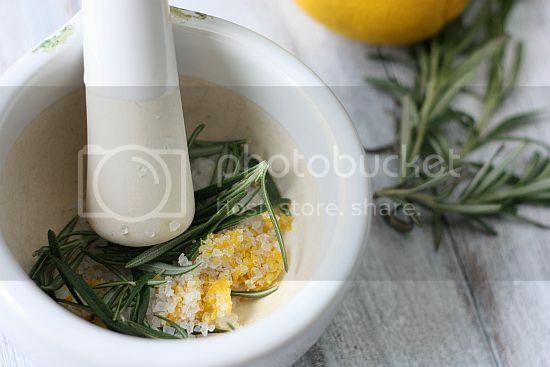 Then add in the remaining 3 sprigs of rosemary. Cut the lemon in half and stuff it into the cavity. Finally truss the legs of the chicken with some string. 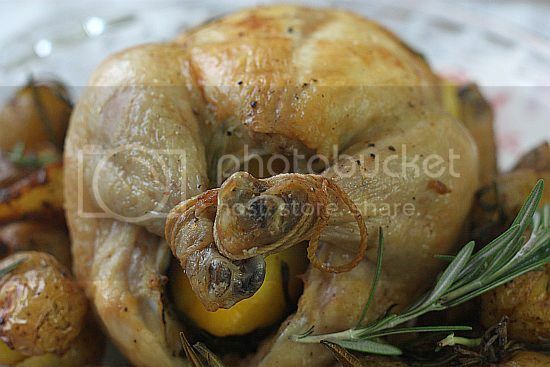 3) Next push the small cubes of butter under the skin of the whole chicken. Try to get the butter underneath as much skin surface of the chicken as much as possible. As the butter melts in the oven, it penetrates the skin and flesh and makes it more flavourful. 4) Then use the finer salt mixture to rub over the entire chicken. Finally using a brush, coat the outside of the chicken skin with the olive oil. Don't use all the oil as you will be basting the chicken several times during the cooking process. 5) Heat the oven to 200C and roast the chicken for about 45 - 55 minutes. Cook breast side up first. Every 15 minutes of cooking time, remove the chicken and brush the whole chicken with olive oil. Turn the bird half way into cooking time, so that the underside gets brown as well. 6) To check if the chicken is thoroughly cooked, pierce the thickest part of the chicken with a skewer. If the juices run clear, then the chicken should be done. Remove from oven and let sit for 15 minutes before carving. Boil the potatoes until they are cooked. Remove from pot and place onto a baking tray. 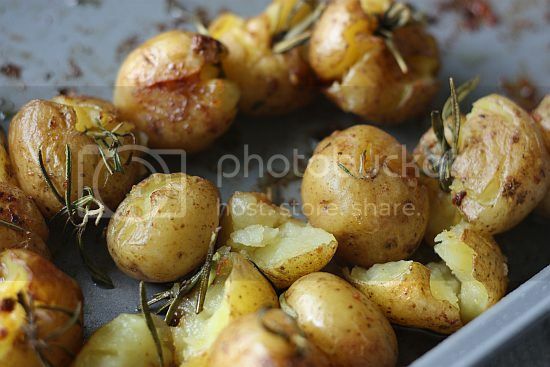 Using a large spoon, squash the potatoes slightly and then place a small sprig of rosemary in each. Using some of the drippings from the roast chicken, cover all the potatoes and then roast in a 200C oven for about 35 – 40 minutes. Wow, this is really so nicely roasted!!! A feast!!! 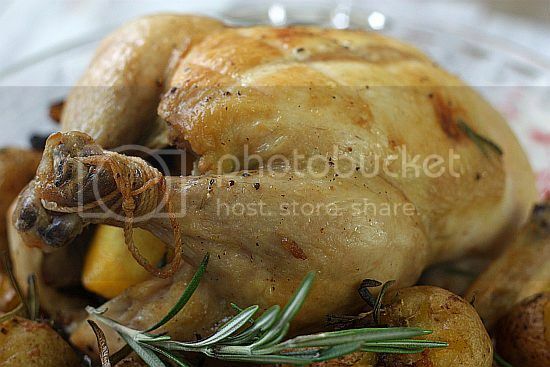 Great looking roast chicken. This is my fav way of cooking chicken if I want a no hassle dinner. I will roast carrots, potatoes, peppers and brussel sprouts with it too. It looks delicious but I don't know how I would feel about the combination of chicken with lemon since I've never had anything remotely like that and I don't even put lemon on my fish like most people I know. I'd definitely give it a chance, though! Yep, a "no hassle" meal is definitely the way to go. It can be so delicious as well! Hi all, thanks for dropping by. It was certainly a delicious meal. In fact I made it again recently as well. oh wow, looks great Jo! 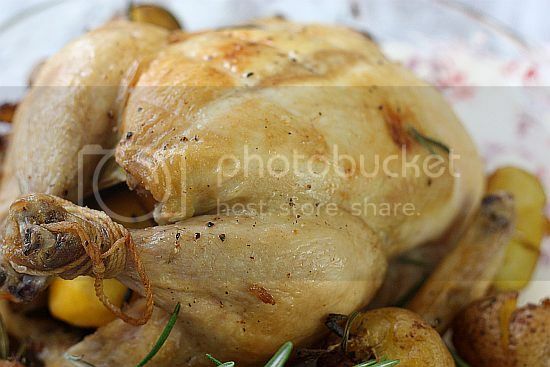 Love roast chicken, so simple and always so yummeh! This is one of the prettiest roast chicken I see. I use lots of rosemary (and thyme) for my roast too. and the squashed potatoes are just perfect to complete the meal.